happy valentines day! we celebrated for two days straight. wesley's class did their valentines on monday because they don't have school on tuesdays. then, that evening we went to my parents house for our monthly FHE dinner. mom made a spectacular lasagna dinner and had the tables looking so beautiful with candles, valentines, and chocolates. such a nice evening! 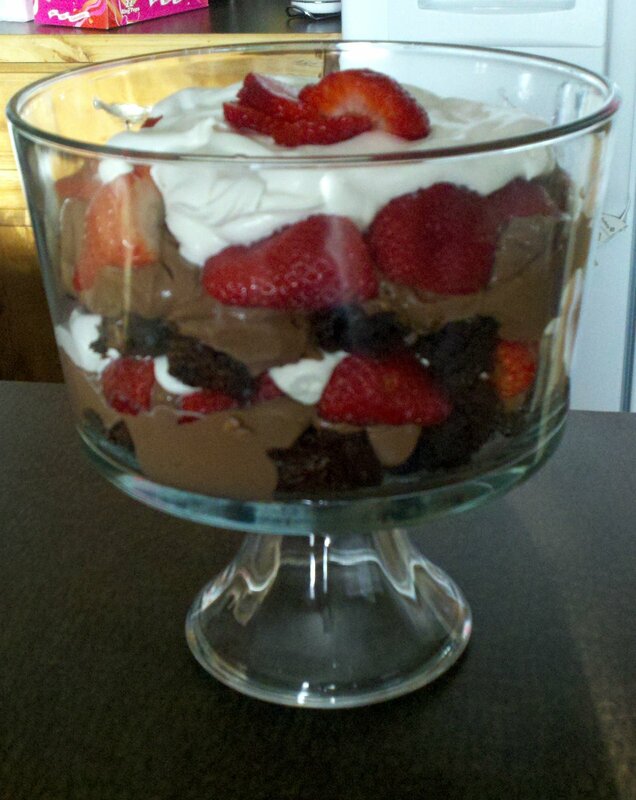 she asked me to bring a "romantic" dessert. :) this is what i can up with. tuesday morning we woke up to our valentine gifts on the table. we gave the kids mini pillow pets, a samples box of chocolates, and a book. they were thrilled! then we enjoyed our heart shaped waffles. then for lunch we went to owen's school since it was "grandparent's lunch day". my mom came and we fed her subway. then it was off to kevin's work to surprise him with strawberries dipped in chocolate that i had made him. it's always fun to surprise him at work. i love all of my sweet valentines! 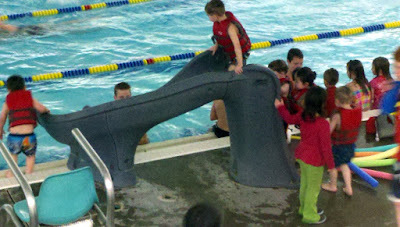 the boys completed swimming lessons the beginning of february. 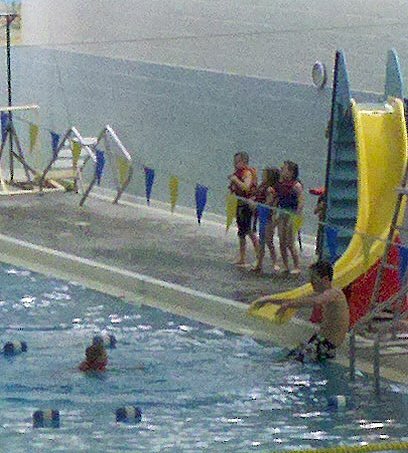 this is their second time doing swimming lessons at the aquatic center. 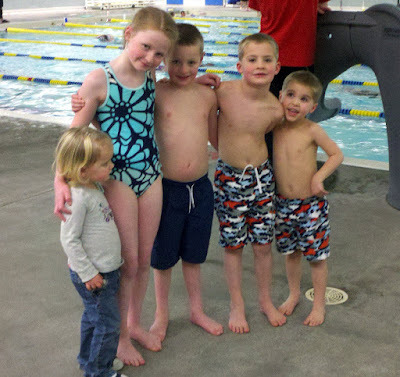 this time around wesley was in the pike class and owen was in the polywog A class with our neighbor and best buddy, carson. carson's sister, paige, was also taking lessons at the same time. maddy ADORES paige. the kids had so much fun taking these classes. owen especially adored his teacher. iceskating in our backyard. this brought back so many memories. my dad made a skating rink in our backyard for a couple years growing up. it was during my college years, but it was still fun to bring some college friends over to play some "ice hockey" or mess around. the weather has been CRAZY here! not much snow. and when we do see snow it melts quickly and then refreezes. messy! one positive from this lousy weather is the ice skating rink mother nature created in our backyard. my parents have some ice skates that they lent us the fit wesley perfectly. we have had some fun out there. wesley is such a funny kid. he is always making wise cracks when asked obvious questions and acting much older than his age. 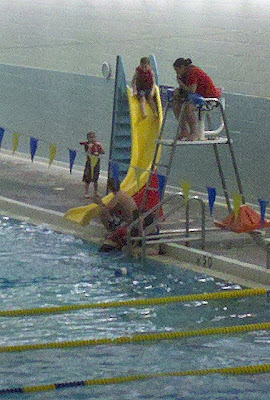 i think this stems from running around with 6 and 7 year old boys. 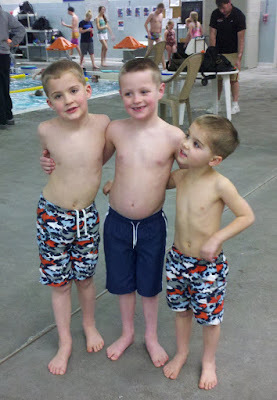 he has always tagged along with owen's friends. i was hoping once we got him in preschool he would make some good buddies that he could play with on occasion. i work at his preschool twice a month and his wisdom has followed him. 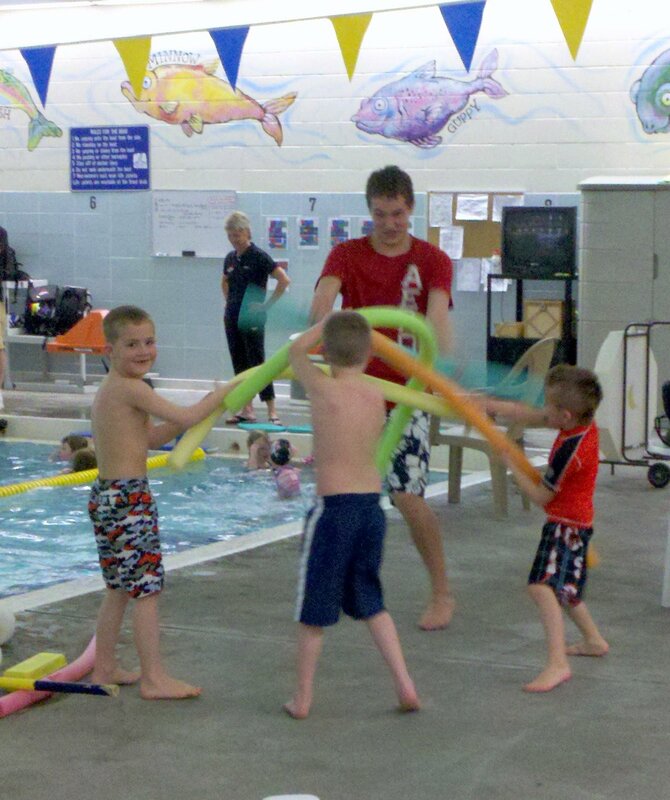 the result: he feels like 4 and 5 year old boys are much younger than him. but, he has met one exception. meet camryn. she lives in the cul-de-sac behind us and has a twin sister, cloe. they are both in his preschool. camryn and wesley are quite fond of each other and really like to hang out together at school. he has also been invited over to their house to play in the snow. wesley has a hard time remembering whose name belongs to who, but he does remember the one he favors has freckles. what a sweet observation! last saturday camryn was spending the day alone with her parents and they asked her what she wanted to do. 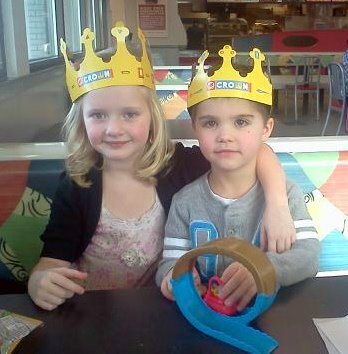 she told them she wanted to take wesley to burger king (because he has talked about how he would like to go there) to get a crown and then go to a movie. so, they did. i hesitated a little bit. but, the two of them really have a good time together. camryn likes to play the things wesley likes so they get along really well. last sunday these kids were making me laugh. i was working on the computer and the three of them decided to rest on the arms of our couches and proceeded to ask each other 50 questions. they were so funny! i loved being able to eavesdrop on their conversation. "is your favorite food chicken?" "is the secret password 'GO'?" "is your favorite color green?" so thankful for these little turkeys that bring smiles to our faces!